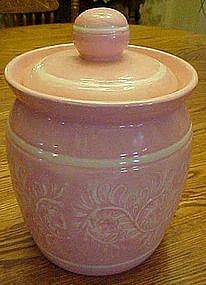 Hand made ceramic cookie jar is pink with white accents. Pretty floral and vines center band. Measures 9 1/2" tall and has been glazed over the decoration. No chips cracks or damages This may even useful in the bathromm or another room for holding other items.